Caroler | First Edition 1E Ponies Figurines | One Price Low Flat Shipping! From Westland Giftware's Hot Diggity Collection, Caroler. Made of resin. Measures 3" tall. 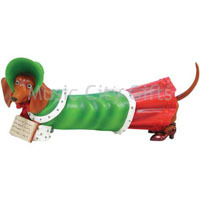 This weiner dog figurine is dressed in a red and green holiday outfit with matching hat and shoes. It is holding a book of carols at its feet. Each adorable dachshund figurine comes in branded gift box.